Lapbooks are a fantastic way to gather information and piece it together for easy learning! They are a great format for themed unit studies because not only are they flexible, but you can make it as simple or as involved as you choose. Lapbooks can cover a wide span of ages from preschool to high school and supplies are minimal and inexpensive! 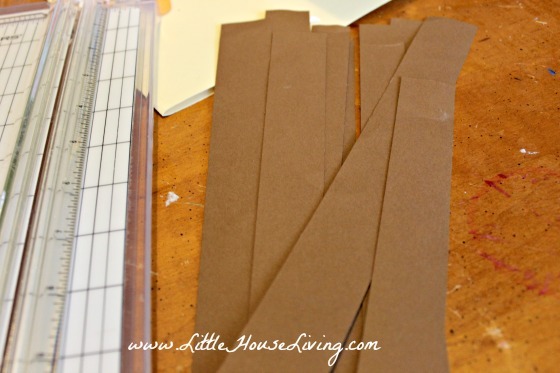 All you need to start is a file folder – you can even pick up a 10 pack of file folders at Dollar Tree for a dollar! But, for durability you may want to go ahead and grab some that cost a little more for the quality; it really just depends on what you want to do with it. 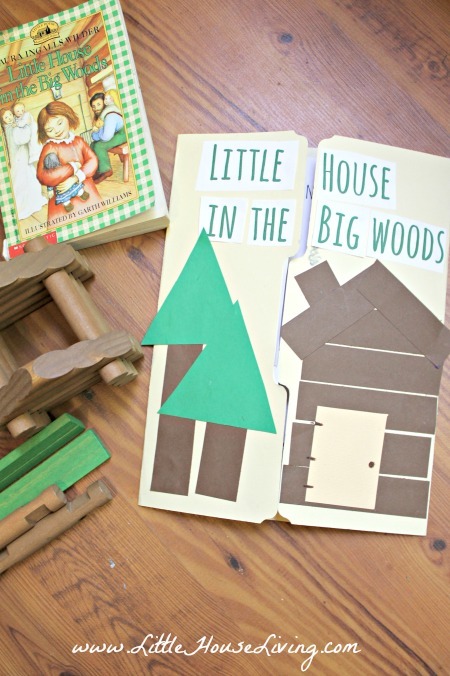 You can download all of the instructions on how to make this fun Little House in the Big Woods Printable Lapbook here as well as read them below. 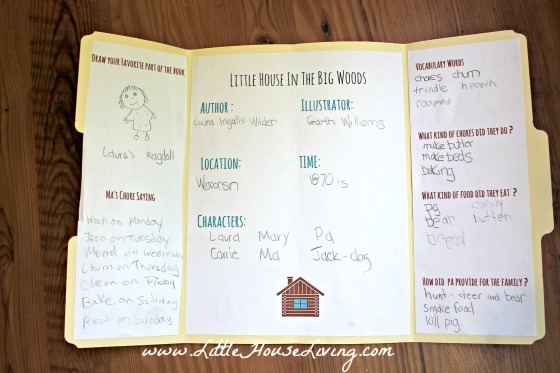 So for our first lapbook post here on Little House Living we chose, Little House In The Big Woods! 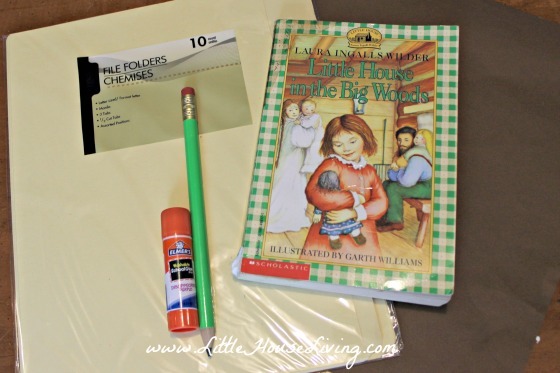 It seemed so fitting with the theme of the blog and we really love all of the Little House series. After reading the book together we gathered our lapbook supplies and got started. 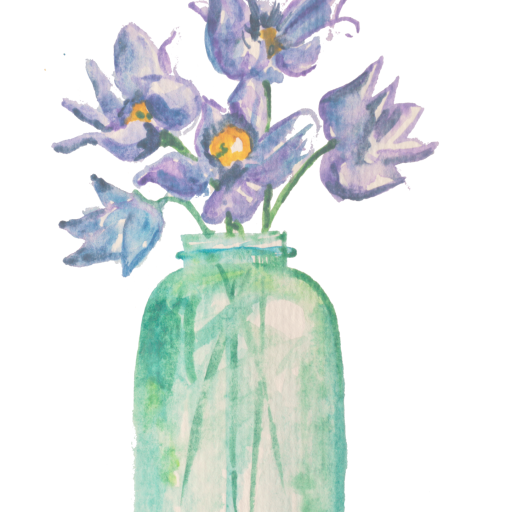 I have even included a couple of free printables here in the post to get you started. 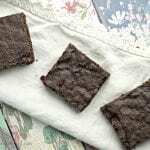 Fold both sides in half so that they meet in the center at the fold and crease sharply. If you are doing an extensive study and need more pages in your lapbook, simply repeat the first two steps and staple them together on one of the outside flaps. Afterwards, I lay it under a heavy book or two to flatten it a bit more. First, we decided to make our cover look like a log cabin in the woods by gluing strips of brown construction paper on the flap. Cut out simple and basic shapes-rectangles, triangles, and small squares. 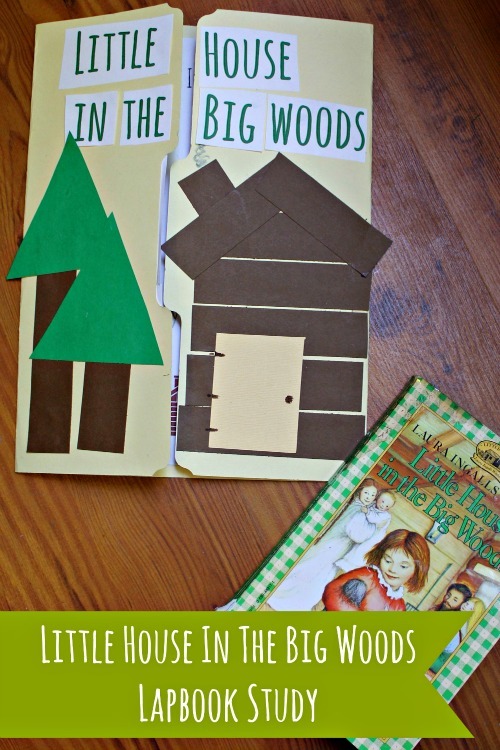 Let your child make a collage art piece on the front to resemble Laura’s cabin and a few trees. Cutting and pasting is great for fine motor development and gave us a little bit of art class in our lapbook as well. You can download the TITLE Page Printable here. Cut out each word of the title and let your child put it together in the correct order for reading practice. The inside center is somewhat like a book report in simplified form. Since I have younger children, a 2-3 page book report is too much for them, so a few lines of writing is just right. If your children are older, you might have them write anywhere from a paragraph to several pages to summarize the story and include details and then staple it to the inside center. On the inside of the fold in flaps we wrote a bit more and also drew some pictures from various chapters throughout the book. Cut it straight down the center and put one half on each side. If it is too much writing for your younger ones, simply leave off some of the sections or let them dictate their answers to you and have you write them. You can download the Information Printable Page here. You can download the Activities Printable Page here. 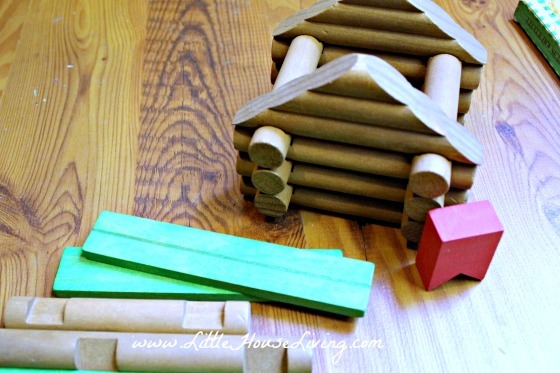 Make a log cabin from Lincoln Logs. Use Lincoln logs to count, skip count, do addition or subtraction. Visit a local working farm, if they allow it, to let the children help with some chores like milking cows, gathering eggs and feeding chickens. Blow up a balloon and play with it like the girls did with the pig bladder. Go to the fabric store and find calico fabric like the girls dresses were made from. 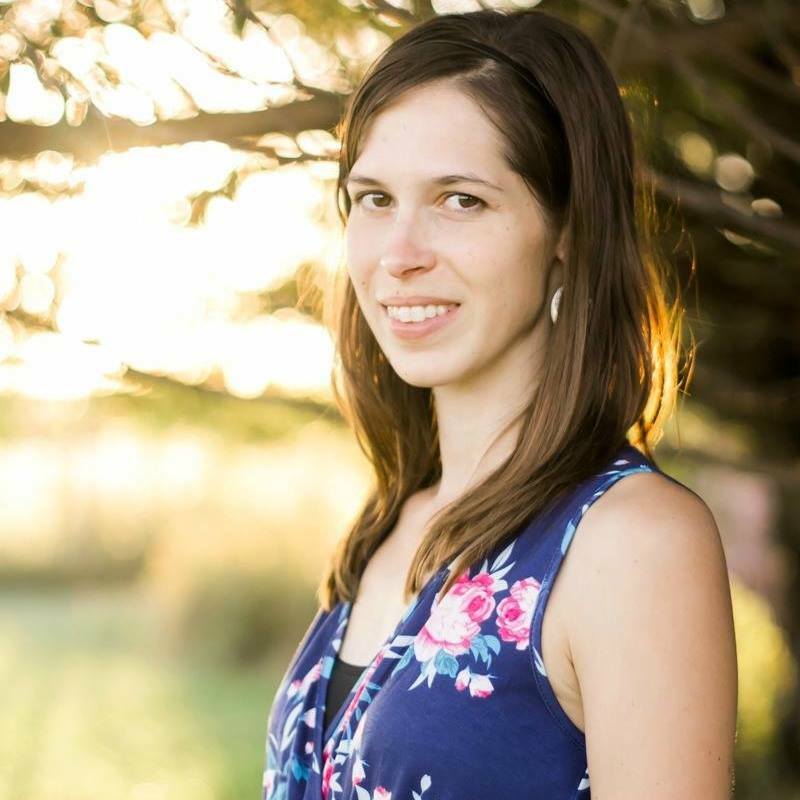 Jody is a work from home mom who enjoys; scrapbooking, upcycling projects, cooking, gardening, homeschooling, and reading. I love the Little House Books! I would really like to get the collection as something to read to my 3 children. It is a story they all like to read about. Just this past weekend we went to one of our favorite places for a fall festival! It is an 1800’s farm. They have volunteers there that are dressed in traditional clothes and teach you the way the original owners of the farm lived. It’s so nice my kids love it there. Ashley, I have been reading the Little House series over and over my entire life. I have a set of books given to me by my sister as a child, but recently I became aware of a full-color collector’s edition with the Garth Williams illustrations. I was so enamoured with them that immediately I went on e-Bay and bought the entire set. They are gorgeous. Might I recommend you invest in the full-color collector’s edition if you decide to get a set. They are paper back but a good quality heavy paper. Check it out! P.S. They came out in 2004 and as far as I can see the first 5 books come in a set and then you have to buy the rest individually. 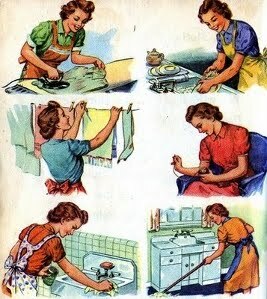 I have a copy of those as well Paula, they are very nice! We are working on the rest of the series, this will be our first post of many! The next one will be ready soon. My children are all older now but when I was still ‘schooling’ them we read through the Little House series (the first six books) several times and always enjoyed it. We never did think to do a lapbook but many other ideas and pursuits were certainly made while reading through the books. Excellent series … until the older years anyway. We did not care for the books past book 6. This is great! We are now on Farmer Boy – I usually read a chapter at lunch time – but I anxiously await your lapbook ideas for that book and the rest! 🙂 Thanks….now I’m off to make your Apple Danish. Gosh how I wish my dds were little again and now I can’t wait for my GD to grow some more to do this with her ! We just went to the Little House on the Prairie Museum in Independence Kansas.. It was such fun ! 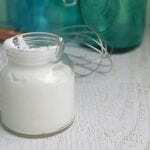 Thanks for that resource, We are doing Prairie Primer and this is great. Pinned it for later. Found your blog on WFMW link party and started following on Pinterest. How do you like The Prairie Primer? I am planning on purchasing it for our next home school year. Love this activity! Love the Little House books! I literally read the covers off mine and I’m shopping for a set to buy for the special little girls in my life because they meant so much to me. I’ve pinned this! I stopped by from Freedom Fridays linkup! 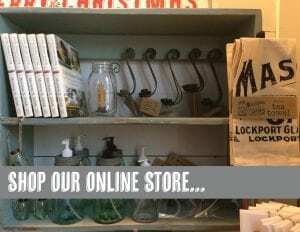 Thanks for posting, we love these books! I have the Prairie Primer, great book! I have most of the books from thrift stores here and there. I plan on using this though!